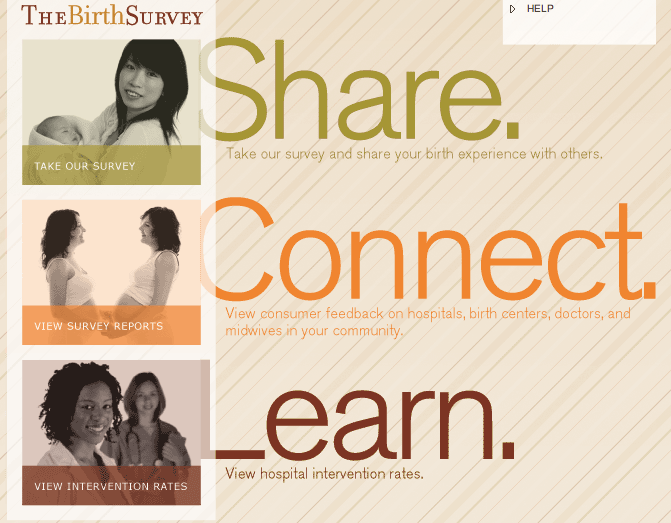 Home / labor and delivery / the birth survey – tell your story! the birth survey – tell your story! If you are at all like me and want to tell every expectant mom (and anyone else who will listen) your birth story hoping it will embolden them to make good choices when it’s their turn, then read on. At last there is a place for you to share your birth experience that WILL impact those who follow. The Transparency in Maternity Care Project aims to “provide women with insight into maternity care practices in their community.” At the heart of this project is The Birth Survey, a 15-30 minute online survey collecting feedback on women’s experiences with their healthcare providers and birthing environments. The majority of the questions are multiple choice, which moves the survey along swiftly, and you can save as you go allowing you to work on the survey during naps or in-between client meetings. This survey launched in NYC this past weekend, and it will become available to women elsewhere in 2008. This project is long overdue as a forum for women to document and give voice to their experiences from prenatal care through labor and delivery to postpartum care. Time and again I hear disappointed women recount their birth experiences only to justify the unmet expectations by the final result: a beautiful bundle of bliss. I know we deserve better and I’m delighted by the prospect of these surveys, coupled with statistical data from state departments of health listing obstetrical intervention rates, enabling women to make truly informed decisions as they move through pregnancy toward labor and delivery. This check and balance will hopefully compel practitioners and birthing environments to utilize the feedback to continually evaluate their procedures and care to best meet the needs of the women and families they serve. Furthermore, it will allow the cream of the crop to get the snaps and recognition they deserve. I took the survey and found that the questions themselves unearthed choices I didn’t realize I had. My eyes are open wider as a result of this survey. I trust that my feedback will make a difference for someone who is already on their expectant journey, or will be someday soon. Now run along and tell your story!